Author’s Notes: Not my characters, only my words. 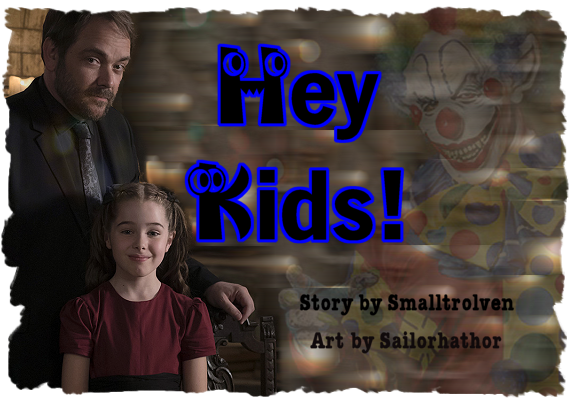 Written for the 2015 spn_reversebang for the very creative and scary art by sailorhathor. Thanks for the thorough and very useful beta, amypond45 you continue to inspire me to keep trying to find the right amount of semi-colons. Crowley’s idea for what was appropriate television programming for children shouldn’t have been surprising. But this dreck was what the King had commanded her charge to watch, as much as possible. Nanny knew that her days were likely numbered having to be this close to the powerful child (and to Crowley), but what choice did she have? Just as Nanny had before she’d become a demon, she attempted to take care of Amara with firm and loving guidance. Whether the child wanted it or not was not her concern. Amara sulked in the corner of the couch, eyes flickering over the television screen as Crowley cavorted with terrifying clowns. It wasn’t funny and she wasn’t learning anything about the world like she needed to. What she needed was to grow and to get out there. The desire to consume was louder than the blood flowing through her veins. She was hungry too. All the time. And not for food, but for souls. The souls of the demons tasted terrible, but they were all she had access to, at least for now. “It’s disgusting. I’m not in training to become a demon. That’s not where my future lies, whether my uncle believes that or not.” When Amara said ‘uncle’ it had knives and sharp edges that cut. Nanny could tell she didn’t like having to call the King by that label; it implied they were family. But Crowley had made it clear that he was to be called uncle at every opportunity by all of his subjects. It was obvious that Amara didn’t consider herself his subject, but that was likely going to be Crowley’s issue, not hers, if she was even around to see it. In case anyone was wondering, her money was definitely one hundred percent on Amara. There was no limit to her growing powers, that much was obvious, and the King was fooling himself to think he’d be able to have any control or even influence over the girl. Nanny chided herself, she’s not a girl, she’s not human or demon, she’s some sort of elemental force, perhaps the opposite of God. Lucifer knows, she’d never encountered anything or anyone approaching this being’s power. Nanny told herself for the millionth time that if she came out of this with her soul and alive to boot it would be miraculous. “I hate him. I hate clowns. And I hate you,” Amara grumped, crossing her arms over her chest and glaring across the room at Nanny. Nanny felt the girl’s stare as an assault on her meat suit; it seemed to cut right through. The peals of laughter and zany music from Crowley’s show broke through the silence and reminded her that she needed to keep Amara occupied at least until Crowley returned. Amara’s eyes glazed over as she watched Crowley’s stupid show; the music was grating on her nerves and watching her fake uncle and the clown tear apart another screaming victim was not helping distract her from her hunger. “That’s entirely up to Crowley. I’ll be sure to ask him when he returns. For now, we only have demons available for you. Stay here and keep watching, I’ll let Earl know we need another.” Nanny shut the double doors and locked them behind her, leaning against them briefly in relief. Being away from Amara, even here in the dank hallways, was like a vacation. It seemed like she was bathed in sunlight and fresh air just being out of that room, away from that child, whatever she was. She could have yelled down the hall to Earl, but took advantage of the break to stay there until he walked past on his rounds. She informed him of the need for another poor demon to come be sucked soulless. Earl didn’t say a thing, just rolled his black eyes and stalked off towards the dungeons. She didn’t have much longer until she’d have to go back in with Amara. Nanny leaned her head against the door and closed her eyes, reminding herself of why she was doing this. Survival, and even more unlikely, possible promotion as Crowley had promised. Nanny heard the laughter as soon as she closed her eyes. Amara was laughing, a cruel, dark sound that came through the thick wooden doors like a smothering oil slick. She shivered involuntarily and steeled herself to go back inside the room. It was important to see what was making the child laugh. Crowley would definitely want to know. “Amara…” she began to ask, then stopped as she caught sight of what was on the television. Two extremely handsome men in plaid flannel shirts were strapped to stools as Crowley and the clown prowled around them. They looked familiar but she couldn’t immediately place them. She saw why Amara was laughing then, the larger of the men was beyond terrified and had urinated on himself as the clown threatened him with a glinting, glitter-covered machete. “Play it again, Nanny!” Amara asked with a chilling excitement in her voice. Nanny rewound the image to the beginning of the scene where the men were first seen. Crowley was paying a lot of attention to the relatively smaller man, he seemed more intimate with him somehow and was allowing the clown free rein to capture the larger man’s fearful attention. “Watch this part, it’s so funny,” Amara squealed with delight, watching with rapt attention as the man’s face struggled with remaining stoic and immovable as the urine dripped down onto the floor from his stool. Nanny looked away, the torture and humiliation of these men was not amusing to her. And it disturbed her that her charge, even if she wasn’t a demon, was so entertained by this. Amara began to growl when she saw Crowley caressing the smaller man’s face. “He’s mine. He’s not to be touched by anyone but me,” Amara’s voice rose towards the end into a near scream. “There, there now, Amara. What are you talking about?” Nanny asked, desperate to find out what had turned the amusement into this near-tantrum. “Dean Winchester. He is mine, all mine. And Crowley shouldn’t ever ever touch him. I need Dean’s soul next. I won’t eat anything until I have him.” Amara crossed her arms and screwed up her face into a disgusted look that some parents would probably call adorable. Nanny knew that it meant a world of trouble for her and anyone else that came near. Earl rolled his eyes in answer and turned to leave, shoving the struggling demon before him. Amara spun on her heel and was flopped on the couch once again before Nanny noticed her moving away. The girl was always faster right after consuming a soul; it was if it gave her an immediate boost of power. Luckily for all of them it seemed to wear off fairly quickly. Although that meant she’d be hungry soon. Where was Crowley anyway? “Are those the famous Winchesters then?” Nanny asked. “Nanny, what’s a consort?” Amara asked from her position on the couch. Nanny leaned against the doors and silently agreed with Earl’s joke. It wasn’t going to be an easy thing to explain to the girl. Thankfully though, Amara was immersed in the TV program again. The scene had changed, now the clown had Sam tied to a medical exam table and was sprinkling glitter over his naked torso. “That looks like it tickles,” Nanny said. “What’s a tickles?” Amara asked. “Dean’s my consort. He will be when I’m big,” Amara said, sounding completely sure of herself. Nanny didn’t want to think about how soon that would be. At the rate Amara was growing, it would be in the next week or so. She looked at the TV screen and wondered if that man, Dean Winchester, knew what was coming for him. He probably thought being stuck in that room with the clown tormenting his brother and Crowley circling him like a lust-crazed shark was as bad as it could get. Being Amara’s consort was likely to be a short-lived gig. And Nanny didn’t really care about Dean Winchester. But she hoped she’d at least get to see the handsome man with someone besides Crowley; those two just didn’t look right together. She watched Dean scream at Crowley to let his brother go, or make the clown leave, that he swore he’d do anything. “Don’t remind me,” Dean growled, pulling Sam even closer to his body. Sam tucked his head into the space between Dean’s shoulder and neck. They looked like a beautiful glittery sculpture. “About that anything you promised, Dean?” Crowley asked, taunting Dean with the clown poking his head back into the room and whispering Saaaaammmm. “That’s too much at once, Crowley!” Dean protested. “I can ask Mr. Bonko to rejoin us if you’d rather,” Crowley sneered. Sam nodded and held out his right arm which was shaking violently now that Dean wasn’t steadying him. Dean grasped his wrist and held it for a moment, and Sam looked up at him with a wounded far-away look. “You’re gonna be okay, little brother. I’m here.” Dean looked at his brother’s lips that were moving continuously as if he was speaking with no sound. “What are you saying, Sammy?” he asked as he started the blood started flowing out of Sam’s arm into the plastic tubing. “‘Kay, that’s fine. Let me help get yours started,” Sam said, taking the needle from Dean’s unsteady hand and pricking him expertly, taping the needle and unkinking the plastic tubing from its coil. He held Dean’s wrist and smoothed his thumb over Dean’s pulse point for several long moments. “It’s pretty,” Sam slurred out, head bobbing on his long neck like he was fighting sleep. “It’s the same as yours, dude,” Dean said, squeezing his hand to get his blood to pump out faster. “I guess…” Sam trailed off, sounding sleepy and about ten years old. His eyes never left Dean’s face though, looking entranced and somehow soft for such a muscled, giant of a man. Dean’s face crumpled a little at Sam’s words and his chin dug into his own chest like he was trying to hide his reaction. “Hey…uh, Dean. Think I’m done yet?” Sam asked, nodding over to the nearly full blood bag on his lap. Amara made a hmphing sound and flopped over on the couch, burying her face away from Nanny. Nanny decided to let sleeping monsters lie for the moment and pretended to care about tidying up the room. She knew she was no Mary Poppins, but things still had to look presentable. “Why’s my program not on?” Crowley asked, slamming the door open. Amara popped up from her couch-burrito position and scowled in his direction. “That’s not true! I liked it, I just didn’t like seeing you touch him like that,” Amara shouted. “Touching the Winchesters? But they were my captives, pet. I had to,” Crowley stroked her hair tentatively. “That’s not your business, Amara. Don’t ask such personal questions,” Nanny interrupted. “No, no, that’s quite all right, Nanny. Leave us now, I want to explain this to Amara myself.” Crowley sat down on the couch next to Amara and made a shooing motion in Nanny’s direction. Nanny bowed out of the room, silently and gratefully. Another day survived! “You took Dean’s blood, and I want to know what you’ve done with it. It should be mine,” Amara answered with a clear threat in her voice. “How do you know about Dean?” Crowley asked, choosing his words carefully. “What about the blood?” Amara asked. “To keep your captive secure so you can tickle them, and to make them draw their own blood. Oh and that glitter gets everywhere.” She flicked a little glitter off of Crowley’s shoulder. Crowley left the room, locking the door behind him. He leaned up against it for a moment in the empty hallway. His thoughts turned to the bags of Winchester blood waiting for him in the refrigerator in his suite. It had been too long since he’d had the taste of either Sam or Dean on his tongue. Other humans had been piss-poor substitutes. There was something about that particular Winchester bouquet. All that lovely pain and sacrifice and destiny made it so spicy and satisfying. But he’d have to deny himself the oblivion of taking any of it until Amara was sorted out. He didn’t dare lose a few days to a blood-drug haze when she was growing and changing so quickly. Any advantage he had a chance at finding was going to be gained in the next few days, and he had to concentrate on that. He knew that his kingdom’s fate would likely depend upon what sort of bond he could forge with Amara. If that was even possible, since she was fixated on Dean. Join the club, sister, was his snarky aside to himself. There had to be some connection between the Mark of Cain and the Darkness, but he couldn’t quite remember the details of the old stories. She either had the mark or she was the mark, or maybe both. He wondered, very briefly, if he should warn the Winchesters. But he thought they’d rather not hear from him for a while. Sam had been rather traumatized by Bonko the clown. That short amount of time in Sam’s mind had given him insights into Sam Winchester he’d never known he wanted to have. He had always known there was a deep, hidden part of Sam that Dean likely knew nothing about. There was so much to Sam that was beautifully dark, but the strength he used to keep it hidden was impressive. Maybe Amara would finally be the key to separating the Winchesters for good. Either one of the brothers willingly ruling by his side would be a sweet victory indeed.